I know it’s still early, I mean, it’s only July, but Christmas will be here before you know it. My fiancé and are finally moved into our new home and the one thing that’s on my mind is getting our first Christmas tree. Christmas is my favorite time of year; it’s such a happy and cheery time. I’m already trying to think of Christmas decorating ideas. I know I shouldn’t be thinking of all this because I should be looking at ways to decorate the house now, not for Christmas. Along with that, I’m of course thinking of Christmas tree decorating ideas too. I have so many ornaments from my childhood that I brought to the new house. It’s just a matter of if we want certain colors and themes on the Christmas tree or if we want random things. I personally have great Christmas tree decorating ideas. All of the ornaments I have are from when I grew up. I travel once in a while, so I pick up an ornament from that state or island. I’ve also made a ton of ornaments when I was younger, as do most kids during school. The Christmas decorating ideas I have are great. I’ve already gone shopping a few times to pick up some really cute decorations. I have this tiny chair that’s decorated with Christmas paints that stands about 15 inches tall, it’s so cute! I have no idea where we’ll put it, but you know I’ll find a spot for it. And of course I found these really cute wooden people. I bought a boy and a girl that will go great on top of our fireplace. In a way, they kind of look like us too. 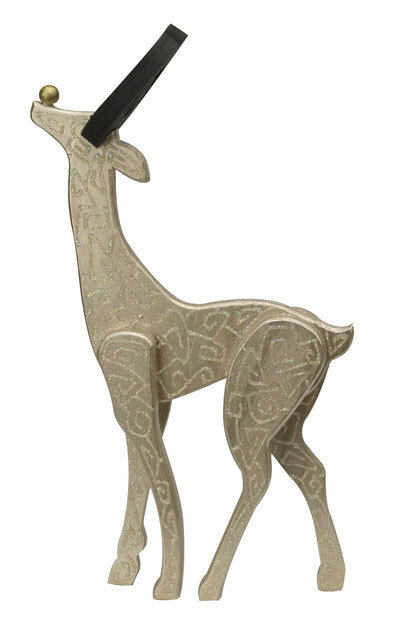 I really like this Christmas deer. I think it would look really neat outside our house especially when there is some snow on it. Some other great Christmas decorating ideas I have along with thousands of other people are the Christmas wreaths. I bought a few that were made out of red and silver bells. It also has glitter on them, which makes them sparkle. Some of the plain bells I bought will make for great Christmas tree decorating ideas. You can never have too many bells hanging on the tree. I also like to add some candy canes to add a little extra something. There’s one thing though that makes Christmas the special holiday that it is. Every year my family gets together with all the kids. We sit in the living room and pass around our stockings so everyone has a little something to open before we get to all the presents. It’s just a magical time watching everyone’s eyes light up and just be happy because we’re with family. That’s one thing I’m looking forward to this year with my fiancé. It’s our first Christmas together in the same house. It’s going to be very exciting waking up next to him Christmas morning and just saying “Merry Christmas.” And if you have a dog, the bones and kisses stocking would be great for him. Those stockings are a must-have for the Christmas decorating ideas. Christmas just isn’t Christmas without the stockings hanging from the fireplace. I’m not even sure if we can hang ours, but there will definitely be a special place for them. And although we don’t have any Christmas traditions yet, this year is going to be that year. We’ll have so many great memories and I’m sure there will be one thing that we will love so much we just have to do it every year. There are tons of Christmas decorating ideas you can have. Check them out here!